*All comments become public record. 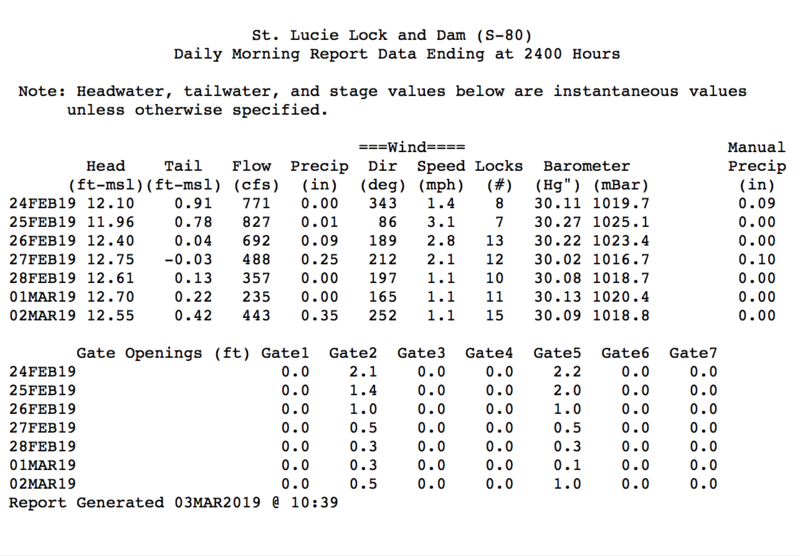 Last week, on Friday, the ACOE announced in order to lower Lake O for wet season, it would begin discharging for the next 21 days from Lake Okeechobee into the St Lucie River/Indian River Lagoon with an average of 500 cubic feet per second through S-80 at St Lucie Locks and Dam. My husband, Ed, and I took aerial photos at the beginning of these discharges on 2-24-19; we continue our documentation today, and in the future. The first set below was taken on Friday, March 1st around 3pm. The second on Saturday, March 2, around 12:30 pm. In both cases, it was an incoming tide ~with more sunshine on Saturday. Obviously, one can see negative changes in water-color and clarity after one week of discharges. 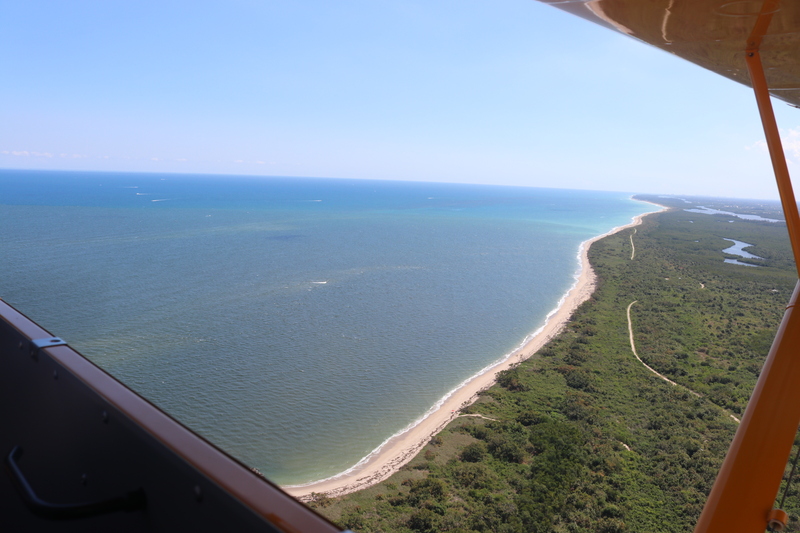 In this photo one can see the airstrip at Witham Field with flight going over Crossroads of St Lucie River and Indian River Lagoon as confluence meets at Sewall’s Point flowing out to St Lucie Inlet at Hutchison Island. The bare sand was formerly rich seagrass beds that have been devastated by the discharges. 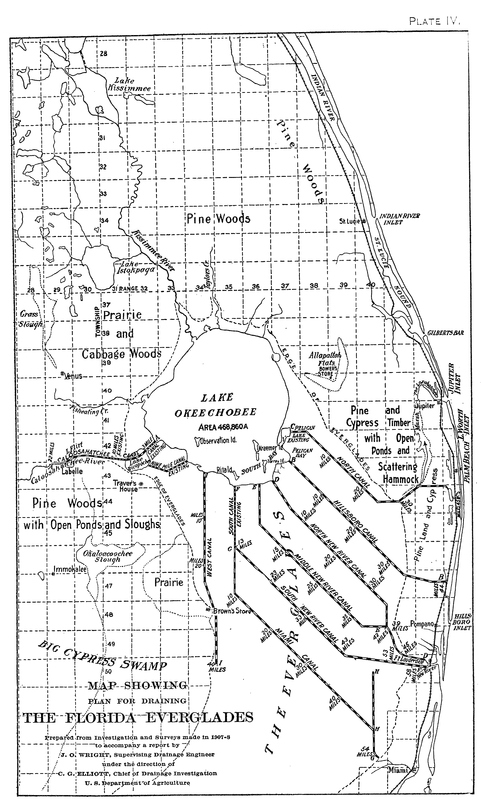 All photos are taken in this area of the St Lucie Inlet. 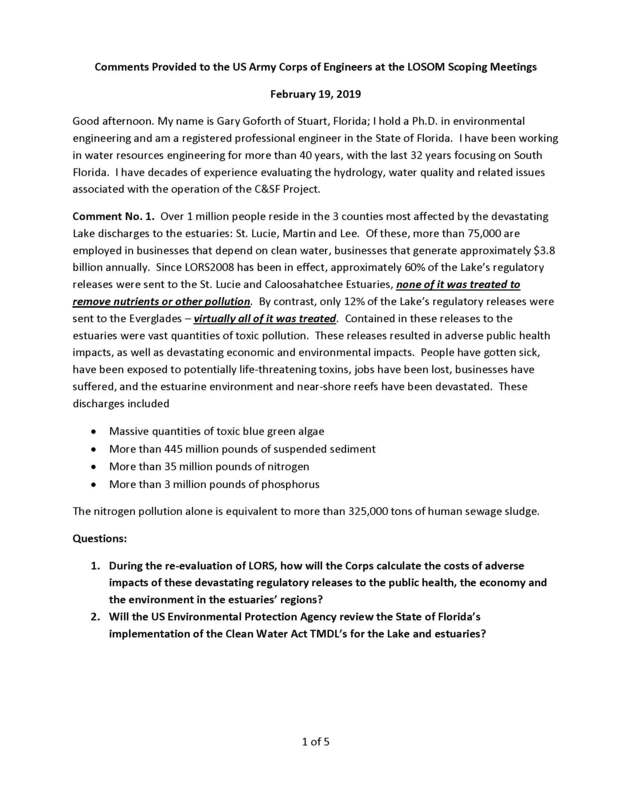 Today I share Dr. Gary Goforth’s (http://www.garygoforth.net/Other%20projects.htm) comments to the Army Corp of Engineers’ LOSOM scoping process that occurred on Tuesday, February 19, 2019, in Stuart: (https://www.saj.usace.army.mil/LOSOM/). Dr Goforth’s comments are helpful for all of us. I am publishing them today with his permission as a reference. 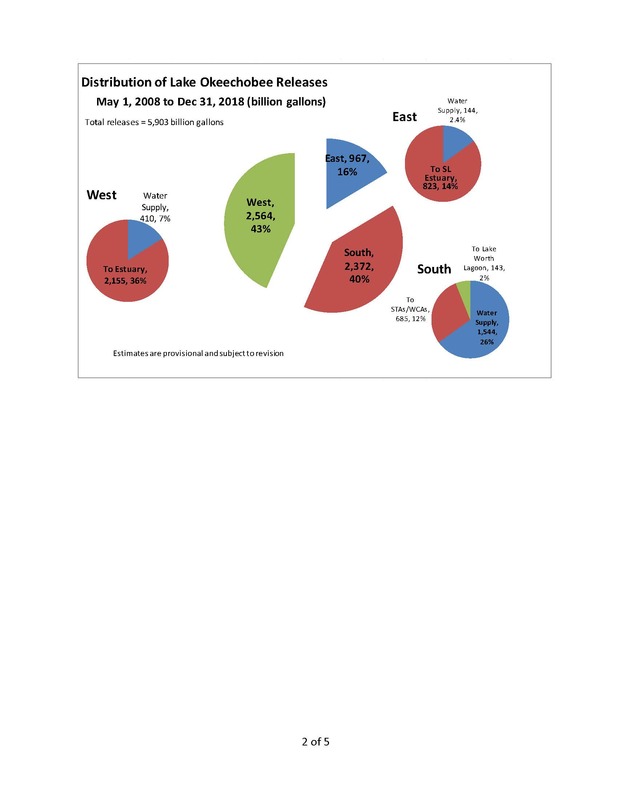 You can read in PDF file link, or below. 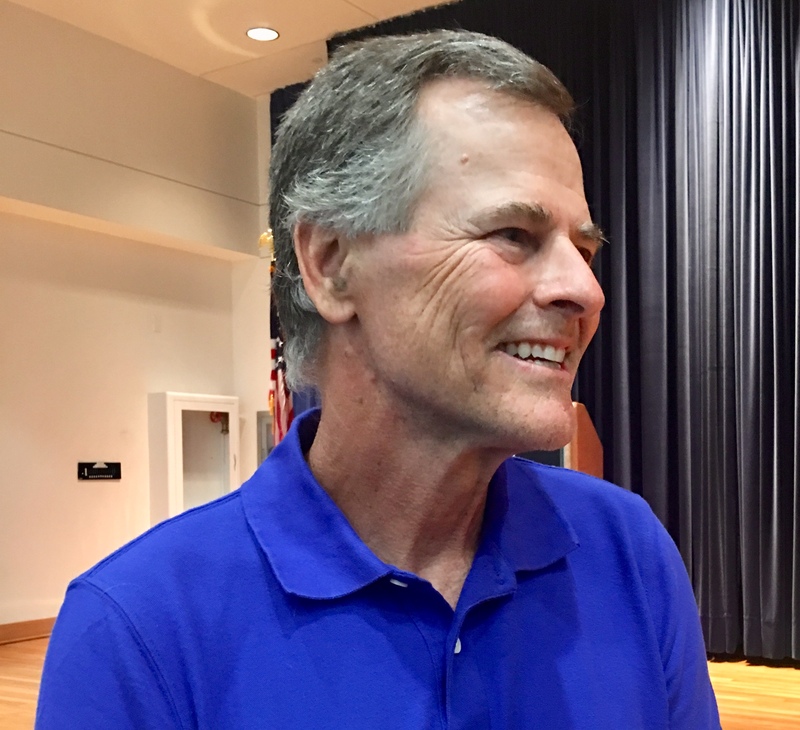 Thank you Dr Goforth for your continued scientific advocacy on behalf on the St Lucie River/Indian River Lagoon! Never, Never, Never Give Up! The second she said it, I was at full attention. This past Tuesday, Sanibel-Captiva Conservation Foundation Director, Ms. Rae Ann Wessel, spoke on the Army Corps of Engineers Periodic Scientists Call. 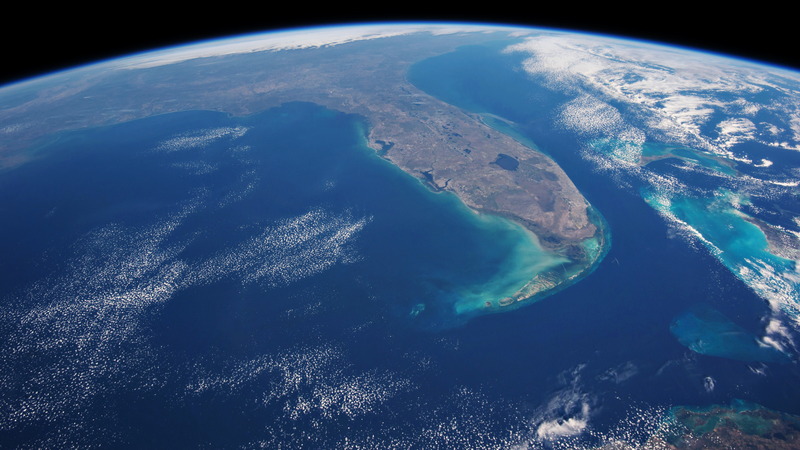 In seven years of listening, in seven years of agency and public comment, I had never heard, seriously, and scientifically, someone address South Florida’s greatest taboo. Wessel was recommending options to the Army Corps and stakeholders regarding the ACOE restarting discharges to the estuaries. 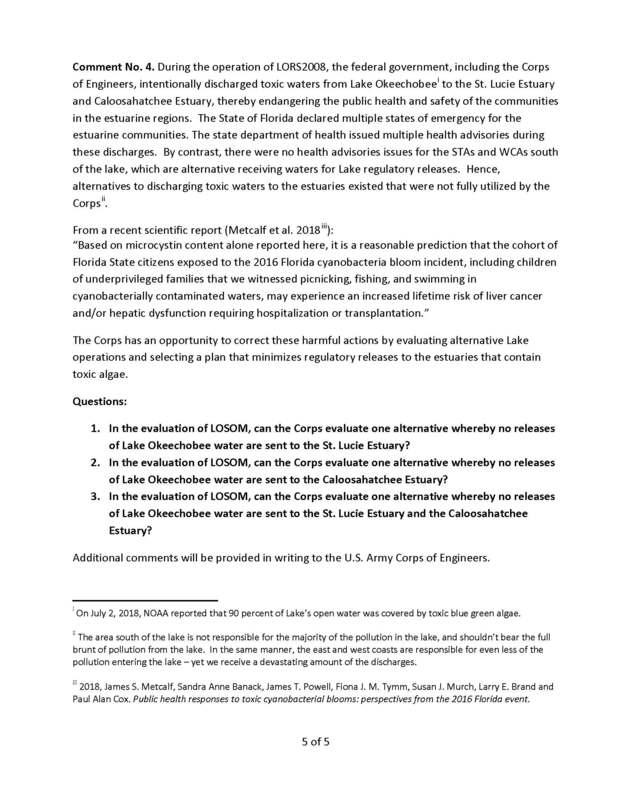 Since the previous week’s call, due to NOAA images showing 90% of the lake covered in cyanobacteria blooms, and crisis of algae in both estuaries, the Governor and other powerful politicians asked the federal agency to temporarily stop discharges considering all options before discharging, once again. Just the previous day, before Wessel’s comment, after viewing the putrid algal mess in the Caloosahatchee, Gov. Rick Scott called for a State of Emergency encompassing seven counties. 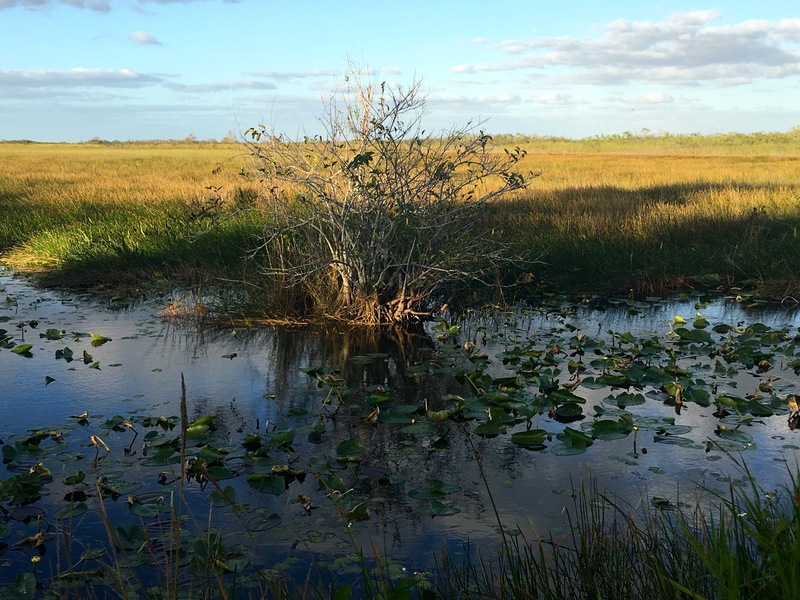 Some history, earlier this year, the Caloosahatchee was almost begging the South Florida Water Management District and ACOE for water, but was denied. 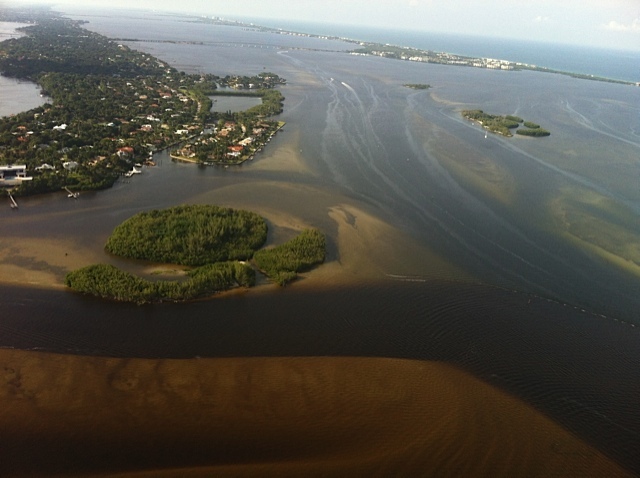 Now the Caloosahatchee is receiving so much water, with algae to boot, that they are experiencing a toxic summer similar to what the St Lucie experienced in 2016. The Caloosahatchee has had it especially tough this year. The elephant in the room, or perhaps better described as the Tyrannosaurus rex in the room, is that with Lake Okeechobee over 14 feet, and the fact that we are now approaching the most turbulent part of hurricane season, the ACOE “has to start releasing again,” like now! And everybody knows this. Therefore, Rae Ann was looking for options, for sharing adversity, and this was fair as the Calloosahatchee has bore most of the adversity this year. She wasn’t talking about flooding the cities in the EAA, she was inquiring about flooding the fields, by less than a foot of water that would evaporate quickly at that extension and depth, maybe stressing but not killing the crops. Sugarcane in particular, is a hardy and durable crop for intermittent periods of water. So why does the ACOEhave to dump to the estuaries? Why is it taboo to talk about flooding the fields? Because although the 2008 LORS talks about shared adversity the EAA is federally protected by an older and more important document. The ACOE in not a teacher picking favorites, they are the military taking orders from Congress. 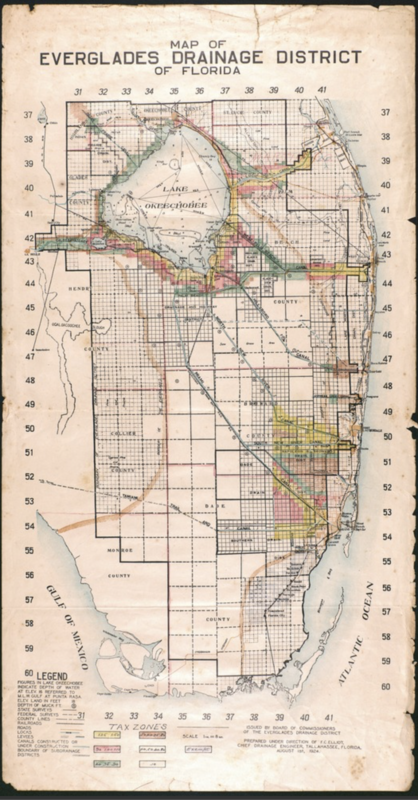 First, the Corps would build a levee from northwest Palm Beach County to the south of Dade County along the east coast, thereby preventing flooding from the Everglades to the coastal communities. 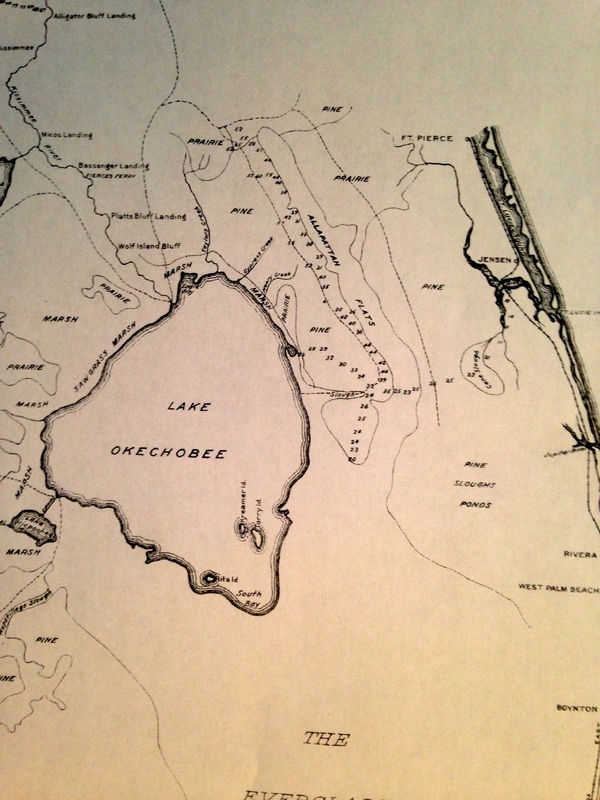 Second, the Corps would modify control facilities and levees around Lake Okeechobee in order to create more water storage, and it would increase the discharge capacity from the lake in order to prevent flooding. 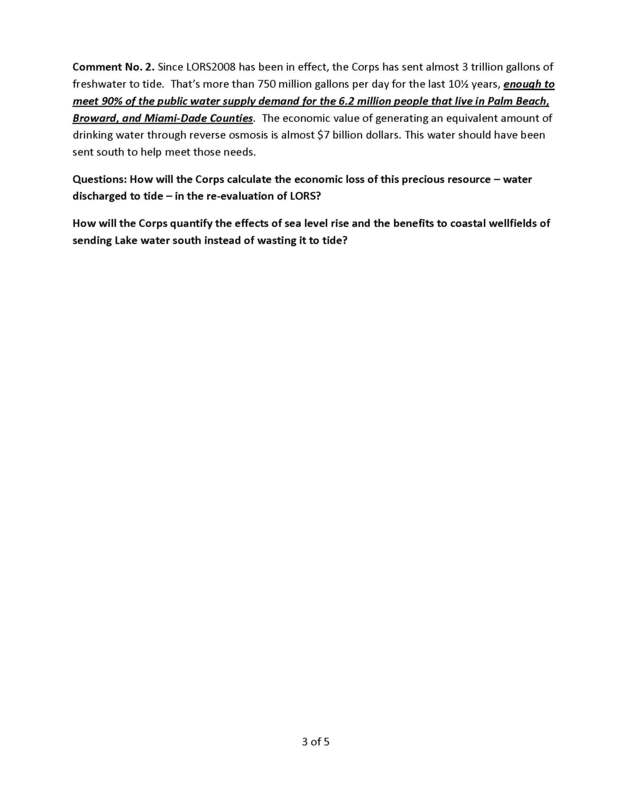 Third, the Corps would create three water conservation areas in Palm Beach, Broward and Dade counties for water storage. 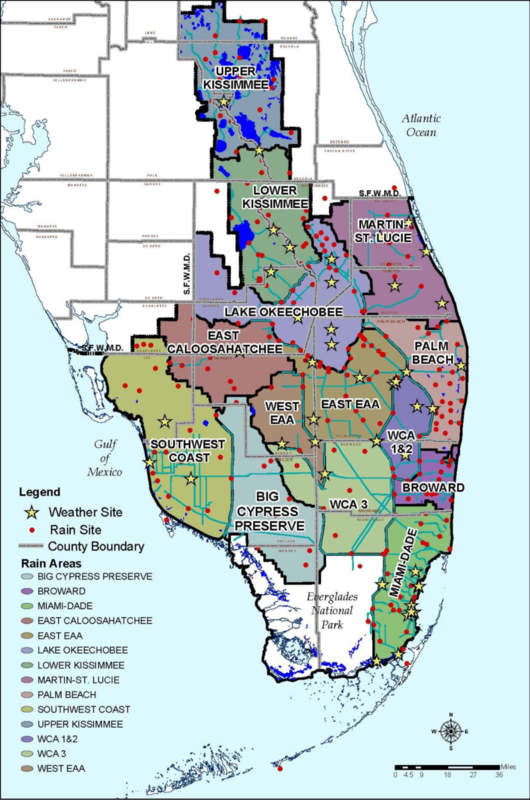 Fourth, the Corps would construct canals, levees, and pumping stations to protect 700,000 acres of agriculture south of Lake Okeechobee in Palm Beach, Hendry, and Glades counties, known as the Everglades Agricultural Area (EAA). 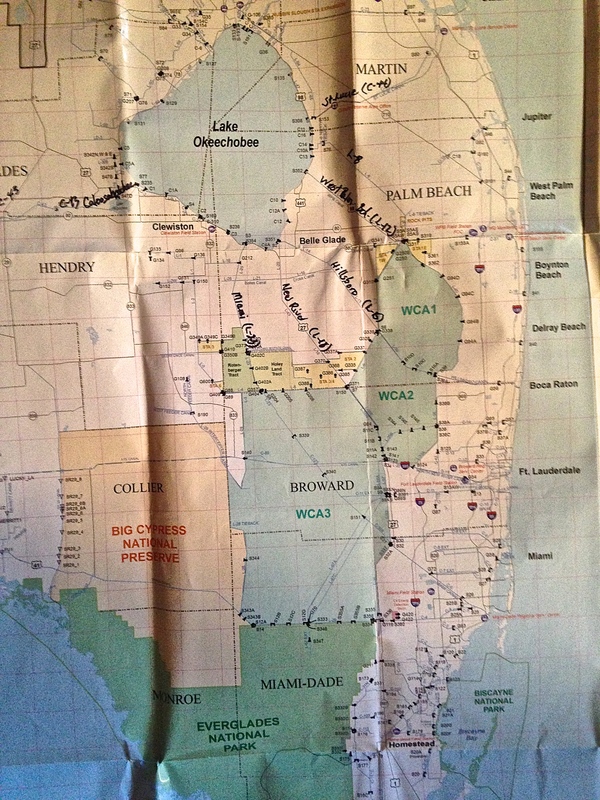 Fifth, the Corps would build canals and water control structures to handle drainage in Dade, Broward, Palm Beach, Martin, and St. Lucie counties. This bolded section is the key, this is why Rae Ann Wessel’s question rung so loudly in the silence of the ACOE call. 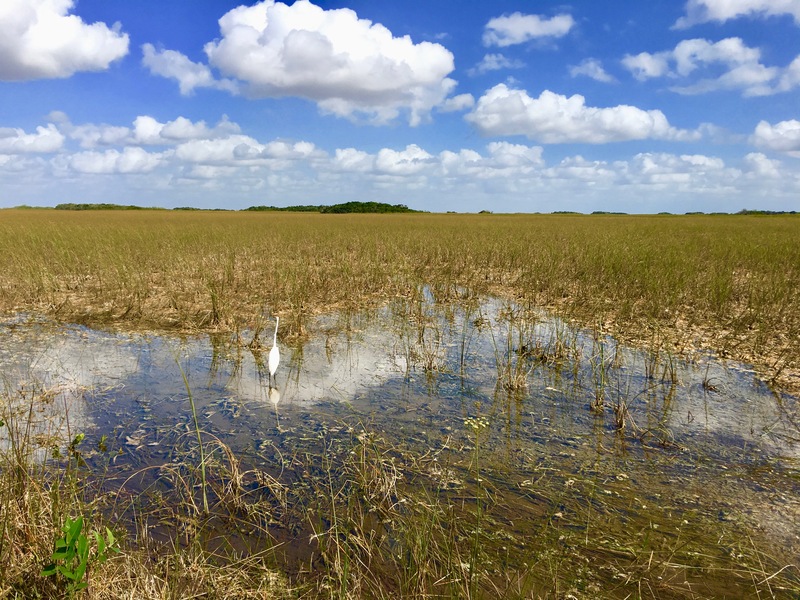 For the ACOE, it is “understood,” that no matter the case, even with LORS, and in spite of “shared adversity,” that 700,000 acres of agriculture fields, south of Lake Okeechobee is to be protected from flooding destruction. But as we all know, nothing lasts forever. Just like other laws of our great county, some do, indeed over time, become outdated for the times. Things change. 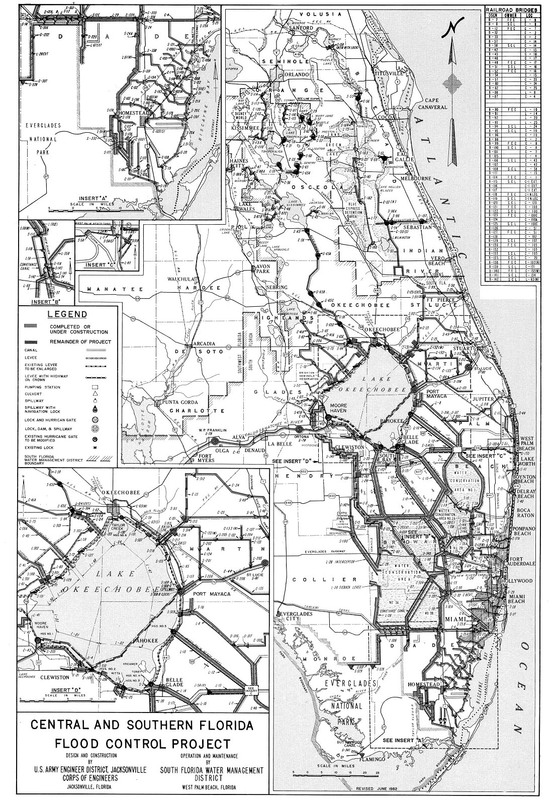 Among other issues, in 1950, when the Central and South Flood Project law was structured and voted upon to protect the crops in the EAA as part of flood control 2.81 million people lived in Florida. Today, 20 million people reside here. In the old days, the discharges did not have the impact as they do today, the rivers were healthier, and the Lake, it wasn’t so polluted. But now, seventy years later, water quality, pollution, and human health issues have risen to a point of question. “In emergency situations”, is discharging cyanobacteria water from Lake Okeechobee into the now heavily populated areas along the estuaries to prevent flooding of the Everglades Agricultural Area in the state’s best interest, or is it archaic, like the T-Rex in the room? It might be time to re-evaluate South Florida’s greatest taboo. s.wordpress.com/2018/07/img_2525.jpg”> Caloosahatchee algae bloom 7-6-18, photo courtesy Dave Stone. Ed and I have just returned from vacation. 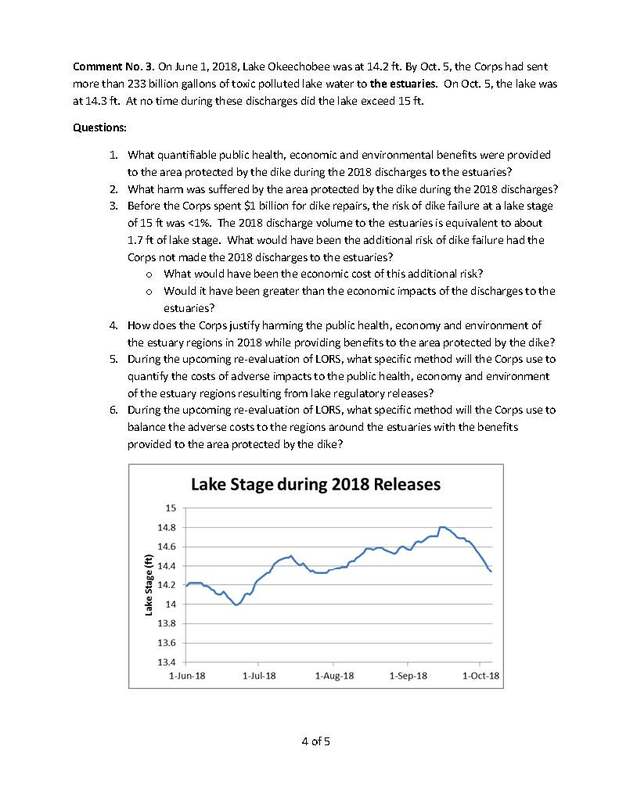 Ironically leaving June 28th, the day the ACOE announced a nine-day reprieve due to algae in Lake Okeechobee; and returning July 8, the day before the ACOE may open S-308 into the St Lucie River once again. It was a great trip and the weather was excellent. Ed was our pilot, and we flew with stops from Stuart to Michigan. It was remarkable to sit in the airplane and see the land below me ~ever changing from swampland, to farmland, to cites, to forest, to mountains, to rivers, and peppered with hundreds of lakes…. When we finally approached the Great Lakes Region, I was looking for the algae I had read so much about, and yes, there were some lakes turned green. But not in the vast northern waters of Lake Michigan, or Lake Huron, these lakes were deep mirrors of blue. “The water here looks like the Bahamas,” Ed noted. We both looked in wonder at their hue. Sometimes, I awoke at night, thinking of home. Thinking about how there is nothing like it, in spite of the many wonders of our great county. In spite of the beautiful, blue, icy waters of Lake Michigan. 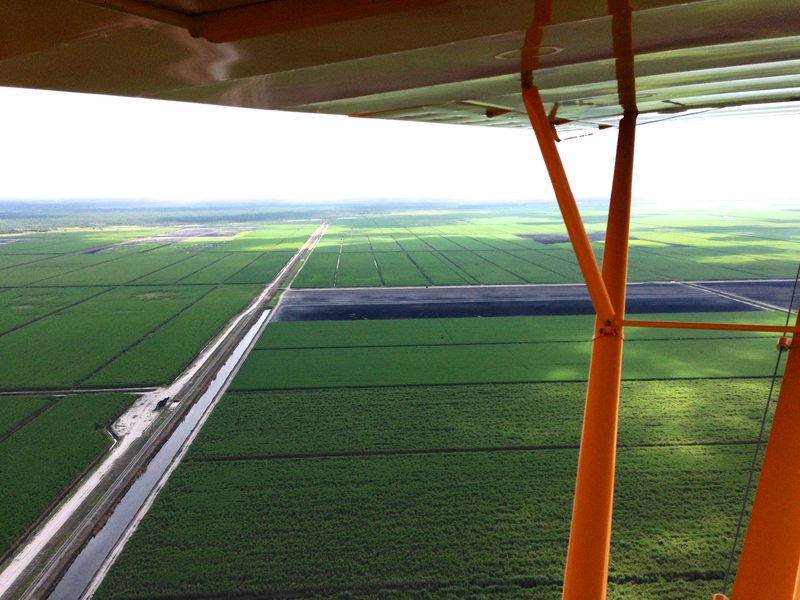 On the way home to Stuart, I asked Ed if we could fly inland over Lake Okeechobee just to see. It was midday and the clouds had popped up and I knew we’d have to do my least favorite thing, fly though them. As the turbulence engulfed the airplane, I closed my eyes and prayed. And then finally, as always, we were through. The lake opened up before us like an ocean. I could clearly see the algae at about three thousand feet. It was visible roughly a mile off the lake’s east coast out into the lake for as far as the eye could see. Ed flew west and then circled around. The green masses of algae had been pushed into geometric designs by the wind, and they were everywhere. We flew for miles over the middle of the lake and beyond. To my surprise, the repetitive, endless, formations of cyanobacteria caused something unexpected to happen. Rather than my usual disgust, or anger for the destruction of the St Lucie, I felt myself begin to tear-up. “This poor lake,” I thought to myself. “I know you were once so beautiful even mythical; what have we done to you? S-308 algae was visible about a mile off the east coast of the lake and on and off, sometimes heavy, inside of the S-308 structure and in the C-44 canal to S-80 at St Lucie Locks and Dam. I am posting this, not because I want to but because I have to. I much rather be enjoying the day instead of once again sitting at my computer. But time is of the essence. This morning I read a comment by TcPalm reporter, Ed Killer, on Facebook stating the ACOE’s pulse release schedule for the St Lucie River. If this is true, and with Ed Killer posting, I believe it is, the ACOE will start releasing again Monday, 6-25-18. I did not know this until I read his post. Today, my husband Ed and I were flying other people over Florida as usual, and during our flight I took this video expecting maybe some algae in C-44 but instead also found the gigantic bloom against the gates of S-308 in Lake Okeechobee leading into C-44/SLR. As Monday is tomorrow, and I fly to DC with the River Kidz tomorrow, I am posting this now. I truly believe considering the circumstances, that the ACOE should refrain from discharging at S-308 or S-80. And the state’s FDEP (Florida Department of Environmental Protection) should have this water tested, again, as bloom has changed. To just dump this on the people of Martin County along the St Lucie River is a crime. The recognizable shape of S-308 the entrance to C-44 and the SLR. Lake O’s connection to the river—obvious massive algae bloom at gates. Bloom as satellites show is throughout and scattered in lake. This shot is looking more towards middle of lake in southern area. Entrance to Caloosahatchee on west side of lake and near Clewiston Bloom is all through lake.